It is one of life's paradoxes: Your eyes drive you crazy from itching due to spring or summer allergies. And yet-as you know all too well-the one thing you must not do is scratch or rub them. This article will not tell you it is finally OK to scratch or rub itching eyeballs. That is irritating, inflammatory, and embeds the offending pollen and irritants in the cornea and conjunctiva. The article will, however, offer alternatives to scratching and present recently developed information about the condition known as "allergy eye." The eye's first line of defense against allergies is the complex and extremely thin tear film that covers the optical surface. Numerous environmental factors, from air pollution to air conditioning, can cause evaporation that results in slight, moderate or even severe tear film moisture loss (dehydration). This may be so slight that you don't feel any symptoms. However, if you happen to be sensitive to allergens such as pollen, the allergic reaction will be more severe if your tear film is not functioning at full capacity. 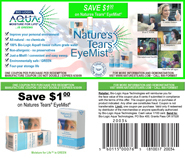 Bio-Logic Aqua Technologies Biomedical Research has discovered that the best (and least expensive) way to mitigate the effect of allergens and other airborne irritants on the eyes is to pay attention to the health of your tear film. An "allergy" may be defined as "an adverse immunological reaction to a substance that normally does not produce such a reaction." Adverse reactions to things like pollen, mold spores and pet dander (called "allergens"), are an allergy because most people are not bothered by them. An adverse reaction to cigarette smoke or bee stings is not technically an allergy because nearly everybody reacts to them. The typical allergic reaction produces symptoms in the eyes, breathing passages and skin. Some allergens only bother the eyes. This article will concern itself only with the effects of allergies on the eyes -- even if the same allergy also affects other areas -- and how to help defend the eyes not only against allergens but all airborne irritants. It is common knowledge among specialists that allergy eye (especially pollen allergies) is worse in hot, dry weather and better in cool, humid weather. That is because many allergy eye symptoms result from dehydration of the tear film's aqueous (water) layer, thereby creating an over-concentration of irritants and allergens. Reflex tearing tries to wash out these irritants and restore the tear film's chemical and moisture balance. However, the reflex tears themselves may contain histamines and chemical imbalances. Standard remedies such as eyedrops and redness relievers may be ineffective against allergy eye because they can wash away the natural tear film, including the evaporation-slowing lipid layer. Chemicals in these products can create their own adverse reactions. The best way to soothe allergy eye, and mitigate the effect of environmental challenges that dehydrate the tear film, is to emulate cool, humid weather by adding add pure, pH-balanced humidity to the air around the eyes. The humid mist will find its way into the tear film's aqueous layer in just the right amount (two to five nanoliters) to help alleviate symptoms naturally and without harsh medicines, drops or chemical formulations. The problem has been finding a way to bottle the natural, fresh, beneficial humidity of a spring rain and apply it to the eyes. This was finally solved by Bio-Logic Aqua Technologies Biomedical Research, Inc. The result is Nature's Tears EyeMist with the uniquely biocompatible Bio-LogicAqua tissue-culture grade of water. A patent-pending mist applicator breaks the water into micron-sized droplets that duplicate natural humidity no matter what the surrounding environmental conditions. Because Nature's Tears EyeMist contains no harmful propellants, preservatives or chemicals, it can be applied whenever discomfort is felt. Application several times a day can help prevent or lessen reactions to pollen and other allergens. Avoiding or alleviating allergy eye. Stay indoors when the pollen counts is at its peak., especially in mid-morning and early evening when wind is more apt to blow pollen around. Keep windows closed and use air-conditioning during peak allergy seasons. Wear glasses or sunglasses outdoors during peak seasons. Allergy-proof your home; put dust-mite-proof covers on bedding and pillows; clean surfaces with a damp mop, rag, or shampooer rather than dry sweeping or dusting. Keep pets outdoors as much as possible if you have pet allergies. Reduce molds by keeping indoor humidity moderate (Note-too high humidity can breed molds, too low humidity can cause other problems such as dry eyes and skin. Shoot for 40% to 50% relative humidity at 70 degrees). Remove contact lenses as soon as symptoms appear. Cold compresses on the eyes (to soothe irritation and wash out irritants). Oral antihistamines (may cause drowsiness). Eye drops and redness relievers (Note: Allergists caution that prolonged use of over-the-counter eyedrops could make symptoms worse). Visit an allergy specialist who can determine the specific allergy and prescribe treatment such as a mast cell stabilizer or a non-steroidal anti-inflammatory (Note: Steroids can cause glaucoma). An allergy specialist can also put you on an immunotherapy program (allergy shots). Maintaining a healthy tear film. Put bowls of water in your house to humidify the air, especially when the heater or air conditioner are on. Treat yourself to frequent long, luxuriant baths and/or showers (shower after baths to wash off residue). Make a ritual of daily facial cleansing. Using a washcloth and very mild, liquid soap, spend five to ten minutes applying repeated hot water compresses to your face. Let as much fresh air into the house as you can, especially in the bathroom. Keep Nature's Tears EyeMist (or Nature's Mist Skin Moisture) at your desk, in your bathroom, car, locker room, etc. Use it before and after cleansing your face in the morning and during the day whenever eye discomfort is experienced.